In case you haven't already figured out, I'm mostly blogging just on my Alana G Yardbarker blog now. So please update your bookmarks and RSS feeds, all you dozens of readers! Also, please check out my coverage of Super Bowl Week in South Florida over at Yardbarker's Super Bowl blog. Don't expect a lot of serious football talk, it's mostly just pictures of hot chicks. MTV Jams is actually running my Tiger Woods playlist idea! Putting aside the fact that I'm totally in the bag for all things MTV Jams related, this is legitimately very cool of them. I can only hope that the blog posts and tweets about this are compiled into some kind of report of anecdotal evidence that Tuma Basa aka @MTVJams is doing the good work with fan outreach. A few days ago I blogged the idea of having a Tiger Woods-themed set of videos, the centerpiece, of course, being Jazmine Sullivan's "Bust Your Windows." I got my Twitter peoples on the case brainstorming video ideas, and fellow sports blogger Mike from Steady Burn blogged about it, declaring: "It is a 100% true statement to say that MTV considering a video playlist inspired by Tiger’s crash is the biggest media development in the Tiger Woods crash investigation at this time." Then today, part 1 actually aired! Jazmine Sullivan: "Bust your windows"
Blu Cantrell: "Hit 'em up style"
Sunshine Anderson "Heard it all before"
This is quite possibly the second greatest accomplishment of my career (the greatest being when I got Diddy to declare his candidacy for President, of course). And it was well worth the effort of the folks at MTV Jams (really, we're helping them do their work, right?). Sorry MusicChoice, I'm now a lifelong fan of MTVJams, Proactiv commercials and all. UPDATE: Here's Part 2 that aired Thursday, all from the original list of suggestions! Snoop Dogg: "Murder was the case"
Public Enemy "911 is a joke"
Wyclef: "Someone please call 911"
UPDATE: this is really happening! Follow the updates on my Yardbarker blog. Contrary to what’s often said, I don’t think the key to success is simply producing good content. Sports bloggers need to understand the distribution landscape and how they can best benefit from it. For small bloggers, being part of a network may be important. But whether your blog is in a network or not, if you’re trying to make money, you need to be business-oriented. It doesn’t matter if you produce serious analytical posts or silly photoshops. Being business-oriented is important for each blogger individually and for all of us as a group. A lot of sports bloggers think they should just focus on making good content because doing anything else would be “selling out.” At Blogs with Balls 2.0 in Vegas there was talk about whether bloggers should strive for page views or the respect of their peers. If you’re trying to make money, your primary driver needs to be page views. That’s not to say that peer respect has no value – if you play nice with fellow bloggers and create content they like, you’ll be more likely to get linked up by them. But there’s a limit to the page views you can get from that small circle of sports blog peers. And don’t forget that blogs like The Big Lead and Deadspin have become very successful while being somewhat “hated” by many of their peers. 1) Think about how you can tweak your content offerings to get more page views. For instance, we all know that certain mass appeal gossip stories are good for page views, and there’s no shame in playing into those story lines, especially if you’re doing it with high quality content (like Sports by Brooks, for example). Of course, the gossip angle is not for everyone, and playing in the “lowest common denominator” game will mean competing with many others. If you want to stick to content that does not play to mass appeal, think about what you can do to make your content unique and valuable to readers as compared to your competitors. You might be able to carve out a niche for yourself and be the strongest in that category – just be aware that your niche is a small part of what’s already somewhat of a niche category, sports. 2) Be proactive about distribution opportunities. On a small scale, this includes promoting yourself to other blogs who might link to your content. (And when you’re sending a pitch email, think about the busy editors who are receiving dozens of other tips daily – be informative but brief in your message.) On a larger scale, this means being proactive about joining a network or getting involved with a large partnership. When the partnership between Yardbarker and Fox Sports on MSN was announced, I received a couple of emails from bloggers who wanted to be involved. Some outlined ideas for how Fox Sports could benefit from their content, some sent me one-sheets about their blog, some offered to write proposals for me to present to Fox Sports. These proactive actions have directly impacted conversations I’m having with Fox Sports as we hash out the details of our partnership, and those bloggers stand to benefit from their initiative. 3) Work together to elevate our industry. The current challenges facing sports blogging include proving our value to reluctant big brand advertisers, league/team media offices, and big distributors. Conventional wisdom is that sports blogs are just the wild wild west – risky to align with. I am not suggesting that sports blogs band together to be vanilla and easy for these guys to swallow. As I previously wrote, I support Deadspin, who differentiates itself by publishing controversial content, even though Deadspin’s actions often contribute to the wild west reputation of all blogs. (Deadspin is pretty good at what they do – if you think they’re not, then that will eventually bear out in their individual reputation.) But maybe there are some things we can all do to increase our appearance of professionalism. For instance, some team and league PR offices struggle with whether or how to include sports blogs in their media coverage – maybe a collective of bloggers should take the initiative to write up some suggested guidelines for them so that we can frame that conversation. Maybe we should draft some best practices? Maybe we should consider dropping the muddy “sports blog” moniker and adopting something like “online sports content”? I’m unsure about the best ways for us to work together, but it’s not unusual for competitors to form industry alliances for certain issues. Of course, maybe the wild west aspect of sports blogs is essential to their appeal. I welcome any ideas on this front. Thank you to everyone who has read this entire series and those who have continued the conversation with me by email. I look forward to your feedback and to the continued growth and maturity of sports blogging. How can you not love Manny Pacquiao? Manny Pacquiao's marketing people are geniuses. Between goofy videos like this one from Fox Sports and punching pumpkins on Jimmy Kimmel you can't not like this guy. Cotto who? If anyone else had done this, I might have ignored it. But this is Niki D'Andrea, and I'm a big fan of running jokes. When last we saw the "reporter" from the Phoenix New Times, she was quoting hilarious excerpts from a satirical blog post as fact and basing an entire cover story on the false premise that NBA Commissioner David Stern was thinking of imposing a "tattoo cap." That's right, she actually believed that each team could be limited as to how many tattoos their players could have. The story made it all the way through the New Times "editing" process and was published as the cover story during All Star Weekend when tons of NBA players and fans were in town. OOPS!! Somehow she wasn't fired, and I later got tired of caring about the so-called journalistic standards of a shoddy old-media publication. 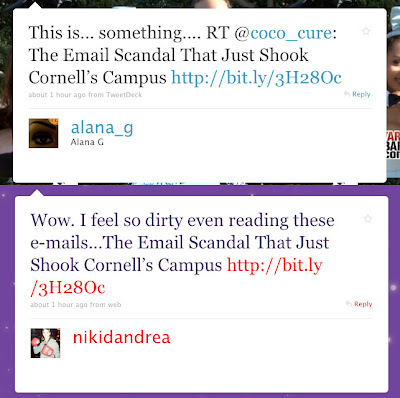 I tweeted a link about a Cornell email scandal, giving RT credit to @coco_cure (Coco actually should have given RT credit to the original source who I discovered later, @guestofaguest). A few minutes later, D'Andrea tweeted the same link, with the same exact headline, and gave no RT credit at all. Why do I think she got the link from me? Because the story is three days old and a Twitter search on the subject showed that very few other people had been talking about it at all today, and not with that particular shortened URL. By the way, it's not like D'Andrea just doesn't understand the concept of RT because her timeline shows she has RT'd plenty of other people. And there was plenty of room to give RT credit. It could be she was just embarrassed to give hat tip credit to me in particular. But more likely she was just hoping I'd write up another one of my blog posts to add to her robust Google search results. I'm always happy to take a few minutes out of my day for that! This is part of my continuing series about what’s next for sports blogging. You can read my introduction here, as well as posts about the tension between ESPN and blogs like Deadspin and the power of distribution in relation to content quality. As a reminder, these are my own personal opinions – although in this post I’ll talk about my employer Yardbarker. Yardbarker just announced a partnership with Fox Sports on MSN that I hope will give our high quality blog content the distribution it needs to be very successful. Part of the partnership involves collaboration on sales, which gives Fox Sports an incentive to promote our blog content (Ben Koo has a great discussion of this). Even so, the partnership is not going to mean automatic success for blogs – I’ll be working on the editorial end of things and I realize that it’s partly my job to show Fox Sports how valuable our blog content is. Many portals (such as the two where I’ve worked, AOL and Yahoo) have teams that are responsible for the homepage only. These teams often judge success by the click-through rates of headlines they place on the homepage. This creates incentives for the homepage team that don’t necessarily line up with those of the entire company or those of sports bloggers in the system. Consider two stories you might find on AOL: one is a thoughtful FanHouse blog post about the end of the baseball season, and one is a short wire story about Khloe Kardashian and Lamar Odom being pregnant. The Khlodom headline will likely click through at a higher rate. As a result, a homepage team may be inclined to showcase that story instead of the baseball one. However, the Khlodom story is not necessarily more valuable to AOL than the baseball one. If a large number of people click on the Khlodom headline just to gawk for a moment and then close the window, that might not be as valuable as a smaller number of people clicking on the baseball story, enjoying the writing, and then clicking to read more FanHouse stories or more posts by that blogger. Even if the time-on-site or total page views are equal for the two, the baseball story still might be more valuable because it promotes the brand of FanHouse and that blogger’s name. Promoting brand helps to build repeat and organic traffic (which is especially important to a property like FanHouse that might not always be able to rely on the AOL homepage firehose). An empty calorie story like the Khlodom one might not have that same effect. In addition to competing with “gossipy” stories for homepage attention, the thoughtful baseball blog post might compete with an article by a well-known columnist. For instance, Fox Sports gets heavy traffic on Jason Whitlock’s columns. Part of that popularity has to do with his actual content, and part of it has to do with his name brand that he’s built up with years of mass distribution. Whitlock has proven that his content guarantees eyeballs. A talented but unknown blogger doesn’t have that same pull -- but if given steady distribution, that blogger could develop that pull over time. I’m not suggesting that portal editors aren’t sophisticated enough to be looking at long-term value or metrics beyond the first click – surely they are. But it’s harder to quantify those other kinds of value, and short-term wins in click-throughs are often rewarded. This creates the incentive to promote the fluffy Khlodom piece or the Whitlock sure thing. So what can we do, given that those with distribution power have incentives that may not favor a long-term investment in budding sports bloggers? 1) We can push them to have a longer view and try to show value with whatever metrics we can. 2) More practically, we can sometimes give them the piece of mass-appeal candy that they want. The blogger who wrote the thoughtful baseball post may not want to “stoop” to writing a fluff piece because that kind of writing could hurt that blogger’s budding name brand. But another blogger could write a Khlodom piece and promote other content from there. Or the baseball blogger could compromise and write a somewhat fluffy piece about Alyssa Milano. Snobby artists may turn their nose up at the idea of playing to the masses – but that’s why most snobby artists aren’t commercially successful. 3) We can highlight the places where blogs can replace standard content. If the star linebacker for an NFL team is out for the season with an injury, that's a headline the homepage editors know they want. So instead of linking to the AP wire version of the story, we can show that a blog post can communicate that same information (which incidentally would create value for the blogger). In the coming weeks, as I continue working with Fox Sports on MSN, I hope to show them the long-term value of the sports bloggers in our Yardbarker Network. One thing that’s going to require is an organized, proactive, business-oriented attitude from our bloggers. I will be talking about that in my next post. Thank you for reading, and as always, I welcome your thoughts in the comments or by email. This post is part of my series about what’s next for sports blogging. You can read my introduction here and my post about ESPN and Deadspin here. As a reminder, these are my personal opinions and not necessarily those of my employer Yardbarker. An opinion I often hear among sports bloggers is that “content is king” or that “the best content floats to the top.” I don’t think this is quite right. It’s true that all things being equal, good content is usually more successful than bad content. But all things are not usually equal, and I think the importance of those “things” are often underestimated. I think the most important of those is distribution from powerful portals (like Yahoo, MSN, or AOL). Consider a simplified 2x2 matrix: content is either good or bad and distribution is either good or bad. Bad content with bad distribution is going nowhere. Good content with good distribution is in the best position to succeed. But there’s a lot of sports content that lives in the other two quadrants. There are distribution resources being wasted on bad content, and there are plenty of small bloggers making good content with bad distribution. This last category of unseen content may be even better quality than some of the content with good distribution, but this content will not float to the top on its own. It’s true that many sports bloggers take pride in linking to quality content they enjoy, and a small sports blog will get a significant boost (relative to its low traffic) from a shoutout from a Hot Clicks or Deadspin. But has that content truly floated to the top as compared to highly distributed content? Are advertisers pursuing this blog and are portals looking to syndicate it? Or is it just a new cult favorite among an incestuous blogger audience? To ask a similar question: how many successful sports bloggers are there today who have truly “floated” to the top because of quality content alone? Quality content is necessary but not sufficient for success. The most successful bloggers were early movers and got distribution deals or an early break from someone like Jamie Mottram at FanHouse, the SNL of the blogosphere (I include myself in that category). The problem of quality versus distribution is not unique to the sports blogosphere. I guarantee you that there are plenty of females who are just as attractive and personable as Rihanna who sing a whole lot better than she does. But those people have not floated to the top like Rihanna has with her mass distribution (which she’s attained through a combination of lucky breaks, years of perseverance, and heavy investment). So why should anyone (especially those who have “made it” already) care about this? First, I think it's important to understand the power of distribution so that we don't focus so exclusively on content quality, thinking that will automatically lead to success (I'll talk about that more in a future post). Second, I think if we can actually get good distribution for the best content, it will elevate all of us. Like it or not, sports blogs are often lumped together in the minds of those who know little about our space. And right now a lot of those people have the impression that sports blogs are bad. Collectively we can try to change that, and it will help all of us in the long run. Imagine if a brand advertiser planning its marketing budget is pitched a “sports blog” package and immediately thinks of high quality content. Imagine if a TV show producer or an athlete like Raul Ibanez hears “sports blog” and thinks of high quality content. We should want to be known as powerful influencers and reliable producers of high quality content – not just pantsless ranters who do nothing worthwhile. Note that I’m making no categorical judgments as to what “high quality content” is. It might be content that follows traditional rules of journalism or doesn’t, that is serious or funny, long-form or short-form, photoshopped or not. There is high quality sports blog content in all of those forms. If you haven't read my post about Deadspin's ESPN horndoggery series you might think I'd argue that what Deadspin did was bad for sports blogging. I actually think the horndoggery series was good quality content. But even if you think it was bad quality content, you can't blame Deadspin for publishing it. What you can do is refrain from reading it and promoting it, and try to influence distributors that it's bad content. I'm not suggesting that sports bloggers should all band together and "collude" on what kind of content is good or bad. I'm just pointing out that we need to recognize that content quality is not the only important factor at work in our business. I'm not sure what small, independent bloggers can do to influence this distribution situation. Linking to good quality content from your fellow bloggers is a start, but it seems like there's a limit to the return you can get from the closed circle of bloggers who do that. The most interesting development to me is the partnerships between large portals and blog networks. Those blog networks can make sure the content they’re offering is high quality. Editors and bloggers are in turn charged with ensuring that on the ground level. Sports Blog Nation (SBN) seems to be getting good distribution for its quality blog content in this way. In my next post, I’ll talk about my employer Yardbarker’s new partnership with FoxSports.com and MSN, which I think will be another step forward for sports blogging. As always, I welcome your thoughts by email or in the comments. Get the Yardbarker Network Widget widget and many other great free widgets at Widgetbox!